Last month I talked a bit about my vocal chain so this month I’m going to look at my current electric guitar signal chain and a little bit about mix approaches. This is one of those things that, again, is sort of ever evolving and highly dependent on what the sources are actually bringing to the table. 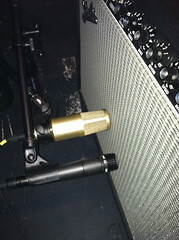 Typically I’ve still got two mics on a guitar amp. One of those is always a 57 and the second one tends to be either a Cascade Fathead II ribbon mic, a Heil PR-30/31 or a Sennheiser 906. I’m also getting a lot of POD’s again these days. POD’s usually end up with a single line, but some of the guys like to hook up “stereo” even though you can’t really get stereo in our rooms due to the size of the venue and loudspeaker coverage–a topic I might finally get to talking about this year since I typically dwell on it for large amounts of time every year…. Another stereo POD concern is some of those are just stereo effects, but you get the actual meat of the guitar straight up the middle where it can walk all over your vocal(s) if you’re not careful…. If I have a single electric guitar in the mix, I typically want to use two sources and will pan them to opposite sides of the room. In the case of mics, I’ll EQ them so they both work, and I’ll do the same thing with stereo PODs. A mono POD might mean double-patching the source to a couple of channels on the console, panning them out, and maybe delaying one side. In that case I might also EQ each input a little differently. It’s just sort of what seems to work best on that day. The nice thing about a single guitar situation is there is usually a good to great amount of space in the mix so I can get away with either a stereo source or a faux stereo thing. When I have multiple electrics I tend to ditch a dual channel approach. I have in the past and sometimes still take the two mics on an amp and pan them opposite each other and then flip things for the second guitar (ex. lead 57 panned left-ish and rhythm 57 panned right-ish, lead 906 panned right-ish and rhythm 906 panned left-ish). The challenge here is doing this tends to take longer to mix because it’s like mixing the 2 guitars together twice: once to get them to fit spectrally in the left side of the PA and once to get them to fit spectrally in the right side of the PA. The advantage is that the small number of seats that gets good coverage from both stacks can get a cool stereo-esque image thing while the majority of the audience listening to really only one stack still gets both guitars. These days, though, I typically pick the mic or POD input that sounds best and use that when I’m dealing with multiple guitars. Sometimes I might stack multiple mics or inputs together for a single guitar, but my results with this have been very mixed over the years so typically the best mic wins; I guess I’d rather overcomplicate things elsewhere than on the mic-side of things. 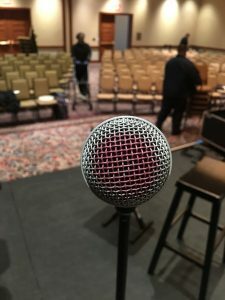 Sometimes it’s the best mic for the entire service, although, sometimes I might use different mics on different songs if one works better for a particular tone the guitarist is using. This also works well when we’re doing material within a service that might feature different musical genres or eras. Sometimes I’ll double-patch a single input guitar like a mono POD into multiple inputs so that I can uniquely treat things on a per-song basis. Sure, I could snapshot some of the stuff, but I just find it easier and safer to patch something to an empty fader where I can quickly crossfade between the two. Imaging multiple guitars for me these days typically means very softly panning each one towards their location on stage, and I can’t stress the word softly enough in these situations. The idea here is to localize the sound a bit to the player on stage while retaining enough sonic information throughout the entire room so that no matter where someone is sitting they don’t miss something important. For example, I don’t want a lead guitarist standing house left to play a solo or critical melody line where the right half of the room can see that he’s doing something but not hear it. That’s just awkward. Pretty simple I think. I generally use just the EQ on the input side to get each input to work both tonally as well as within the context of the mix. Sometimes I’ll use the onboard channel compressor, but it’s usually very rare and only when there isn’t time or ability to do something else somewhere else. The hard thing for me with applying compression to guitars is that most electrics are already compressed on the way in. PODs, in my opinion, typically always sound compressed especially as the amount of overdrive/distortion goes up. Overdoing compression on guitars can make them sound really small, and this is probably my biggest beef with PODs; they just seem to sound very small as guys turn up their dirt. 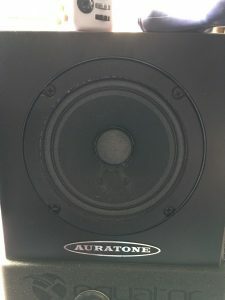 It might be great in their monitors because they’re listening mostly to themselves, but in the context of the mix they get tiny. Next up is the Phoenix. It’s a little color and subtle compression. The thing I like about the Phoenix on guitars are those three buttons: Gold, Sapphire, and Opal. Flipping through these three buttons can help soften a harsh guitar or fatten up a thin one or just do something overall nice on the guitar. They’re not drastic tweaks, but sometimes a little is all I need. Next is the Serato Rane Dynamics plugin set to the dynamic EQ. I will confess that Robert Scovill put the bug in my head to try this one here a few years back, although, my application might not quite be the same as his. Basically I use the dynamic EQ to tame any harshness in the mids/upper-mids that might poke out at times. Again, the beauty of the Serato dynamic EQ compared to every multiband comp I’ve ever played with is the Serato is NOT signal-level threshold based. The Serato looks at a key or target frequency area compared to the entire frequency spectrum of your sound so that when the key frequency is too much relative to the overall sound, you get attenuation at your key frequency. So if I’ve got a guitar that sounds good but gets a little harsh when it comes time to play some leads, the Serato can help even things out and take the edge off to give me a more consistent overall tone no matter what is being played. The problem with a multiband comp trying to do the same is sometimes when a guitar player goes from chords to single note leads, their signal level can actually drop. So if you dial in your multiband to help with lead stuff, you might actually damage the signal when he plays chords. A nice byproduct of the Serato for me is it also sometimes helps make a hole for vocals depending on how hard I hit it, although I don’t usually hit it very hard. After the Serato, the input gets routed to a group; typically I use one group/bus per guitarist. This is because the rest of the processing I do on guitars can be the same regardless of which mic(s) or inputs I’m using on a given song. It simplifies setting things up, and it also cuts down on DSP usage. First up on the group is usually a compressor if I feel like I need one. These days it’s a Waves CLA-3A. The thing about using a compressor here is I’m really going for level control so I want minimal color, and the CLA-3A seems pretty transparent for me. Basically if I’m using a comp here, I’m trying to level out any differences between lead/melody playing and full-on chords. As I mentioned above, some guitarists can play significantly quieter when they’re doing single note stuff vs. full-on chords. The result is sometimes it’s hard to get softer played arpeggios or little melody lines to cut through in the verse compared to power-chord city on a chorus. Some of the guys I get to mix can play very subtle, but cool stuff that can easily get lost under a vocal so I use the compressor essentially to turn them down in the chorus. The big thing, though, is to make sure I’m not making them smaller in the chorus as a result of the compression. I don’t care if guitars get a little louder in the chorus because that can feel good and sound natural, but I might want to reduce the amount of level change. The compressor here is really just about making the dynamic range of the player more manageable so that I don’t have to focus as hard on bringing subtle things out so I can focus on the vocal. I would automate this kind of stuff in the studio, but the comp works as a nice band-aid in live world. The other nice thing about putting the compressor on the group as opposed to the input is that it’s post-input fader. This means I can control the amount of compression I’m using via the input fader. By pulling down on the input side, I effectively raise the compressor’s threshold and reduce the amount of compression. I can also increase the amount of compression by pushing the input fader harder. So, for example, if I’ve got a song where there’s a lot of subtle, palm-muted delay stuff in the verse with a big chorus, I might push the input fader a little higher to reduce my dynamic range a bit for the song to bring out the subtle stuff a bit more without letting the chorus get too big. 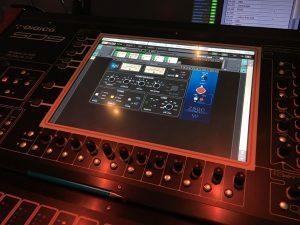 If the next song is a faster, more consistently played song that chugs along, I might pull the input faders back because I might not need the compressors. Since I mix the band using VCA’s, I will typically assign the group fader to a VCA to ride after making input fader adjustments for the start of a song. This just gives me a lot of flexibility on a per-song basis in a way that’s very quick to adjust even if I don’t have snapshots available. The final potential link in the chain is an overall EQ on the group. This is really a last ditch, emergency EQ. These days it’s a Channel G probably set for the G emulation not for any particular reason other than that’s what I’m trying. If there was onboard parametric EQ on groups on the VENUE, I’d honestly just use that because I rarely ever actually use this. This is an EQ primarily for use when something big changes between soundcheck/rehearsal and the actual service and I just need to do an overall fix on a guitar. If it’s a simple service or event where I’m only using one guitar input, I just go to that input and tweak the EQ there because multiple layers of EQ can cause trouble. But if I’ve got 2 or 3 alternating inputs for a guitarist, and I need a quick fix that’s going to follow everything I’m using, I use this EQ. Another way to look at it is this is my What’s-It-Going-to-Take-To-Make-Everyone-Happy? EQ. The one last thing I will say about this setup is that it is all sort of built-in to a new template I’m working on. Within that template I’m finding that the Serato’s and the Group compressors don’t get touched too much. While I’m not typically a fan of cookie-cutter processing, these are a couple that I feel like I’ve gotten where I want them almost universally. I’m simply finding that when I get the stuff dialed in the way I want it earlier in the chain, these later processors tend to work just right only needing a couple little tweaks week-to-week or just simply turned off. The VENUE sounds like a console I need to get my hands on. Too bad we have M7’s everywhere due to $$ at the time. You also mentioned stereo in your room. We tried LCR, stereo, and finally settled back to a mono PA so that every seat gets everything. We have a LARES system in our main campus which can add space, but still, not every seat hears everything if used too heavily. One of our rooms is LCR, but the center channel isn’t a discrete center; you still get center information in the left and right clusters. Personally, I don’t get overly concerned with every seat hearing “everything”. 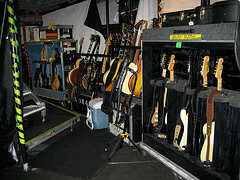 I want to maintain the spirit of the mix throughout the room and get anything critical to all seats. Critical stuff for me would be things like vocals, leads, spoken word stuff, etc. But beyond that, I’m not as picky. For example, if our rhythm guitarist is standing house right, the right side of the house is probably going to hear him a little more prevalently than the left. He’s in the mix on the left side a bit, but not to the same level. This is fine with me because that would naturally be the case if he had a guitar amp on stage that was providing all his audio. Here’s another way I look at it. If I’m standing in the first couple rows on the left side of the room with a lead guitar right in front of me, I expect to hear him and probably a bit more in the mix. As an audience member, I might be intentionally standing closer to him to hear more of him. With him standing right in front of me, my mind is naturally going to expect to be able to pick out his playing at all times. Cheating the guitars a little towards the side they are standing on helps ensure that natural balance a bit.